A ~147 million-year-old Jurassic-aged osteoglossoid osteoglossomorph fish Paralycoptera from outcrops at Lai Chi Chong has been described. This fossil represents the first dinosaur-era fish — as well as vertebrate — from Hong Kong to be identified. The fossil was rediscovered in the collections of the Stephen Hui Geological Museum by Mr. Edison Tse Tze-kei, graduate of the Class of 2014, Department of Earth Sciences, Faculty of Science, the University of Hong Kong (HKU). Mr. Tse studied the specimen during his HKU Faculty of Science Summer Research Fellowship and Earth Sciences Major final-year project, under the supervision of Dr. Michael Pittman who leads the University’s Vertebrate Palaeontology Laboratory and is an expert on dinosaur evolution, as well as Professor Chang Mee-mann, an Academician of the Chinese Academy of Sciences from the Institute of Vertebrate Paleontology and Paleoanthropology (IVPP) in Beijing. A paper on this study has recently been published in the open-access journal PeerJ, demonstrating international recognition of the outstanding ability of HKU undergraduate students in conducting scientific research. The fossil consists of the posterior portion of a small, about 4cm long osteoglossoid osteoglossomorph fish from the genus Paralycoptera, and was collected at Lai Chi Chong, Tolo Channel, from rocks that have been previously radiometrically dated to 146.6 ± 0.2 million years old (Tithonian stage of the Late Jurassic). Paralycoptera is a typical member of the Mesoclupea fish fauna of Southeast China. Its discovery in Hong Kong extends the geographic range of the genus — and potentially of the Mesoclupea fish fauna — by about 700 km further south. The Jurassic-age of the Hong Kong specimen extends the temporal range of the genus about 40 million years back in time because all mainland specimens are currently known from the Early Cretaceous. 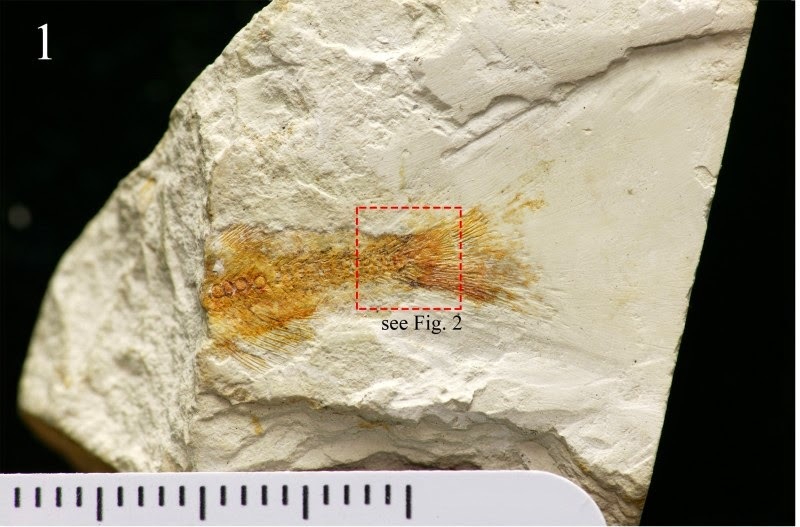 Hong Kong’s last major vertebrate fossil identification was the discovery of a ~370 million-year-old early fish (Devonian-aged placoderm fish) by Mr. Lee Cho-min 35 years ago on the north shore of Tolo Channel, Hong Kong, almost directly opposite to Lai Chi Chong. Dr Pittman said that undergraduate students worldwide typically do not publish peer-reviewed research, so Edison’s valuable contribution towards Hong Kong palaeontology is a credit to him and the research ability of HKU students. The detailed identification and description of the specimen was also aided by Professor Mee-mann Chang, a global expert on Chinese fossil fish. Note: The above story is based on materials provided by ResearchSEA.